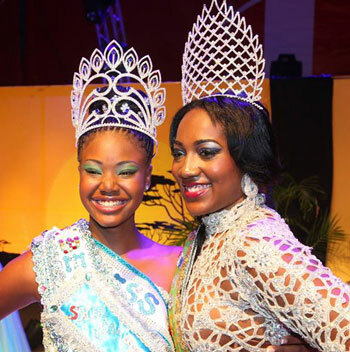 SIMPSON BAY, St. Maarten (April 25 , 2014) - Following in the “royal steps” of Anna Rabess Richardson who took the Carnival Mature Queen crown in style, D’Shnay York and Bria Sorton were similarly crowned Carnival Teen Queen and Senior Carnival Queen respectively. All three carnival queens were sponsored by the Princess Juliana International Airport (SXM). “That makes it 3 for 3,” remarked a Carnival pageant lover, using a baseball metaphor. “You guys sure know how to pick winners,” added another spectator on learning that the newly crowned queens were backed by SXM Airport. In fact, this is not the first time the airport would be the proud sponsor of a Carnival Queen: the reigning Senior Carnival Queen, Davinia Brooks, who will be representing St. Maarten at the PJD-2 Caribbean Queen Pageant on Sunday, April 27, 2014, was also sponsored by SXM Airport. LaBega congratulated all three winners and expressed satisfaction with the hard work and commitment all the contestants put in that made the pageants such a huge success. She also commended the efforts of the Carnival Development Foundation and pledged to continue to support the event as much as possible in the future.